Institutional investors, considered the smart money, continue to shift away from stocks and bonds into alternative investment like real estate. Below we discuss why and how Brookfield Property Partners (BPY) provides retail investors a way to participate in commercial real estate (CRE) alongside institutional investors. We are in the second longest bull market in history, over eight years running. The consensus is equity returns will be below historic averages for years to come. This is due to anticipated interest rate hikes, ending monetary stimulus and, and a reversion to the mean. Add other “uncertainties” to this mix and the headwinds suggest we too should find a way to diversify. Brookfield Property Partners was launched in April, 2013 as the third spin off in Brookfield Asset Management’s (BAM’s) transformation to a global asset manager. Today BPY is a global real estate company with a market capitalization of $5.7 billion; a BBB S&P investment grade credit rating and, employs 14,000. Total assets are $65 billion and assets under management (AUM) are $148 billion. It pays a dividend that yields 5.4%. BPY is one of the world’s largest investors, owners, developers and operators. They eliminate investment barriers to CRE for individual and institutional investors by providing expertise, financial strength, long term focus and, knowledge. The portfolio has three segments; core office and retail both targeting 10-12% total returns. The opportunistic segment acquires mispriced assets and targets 20% total returns. 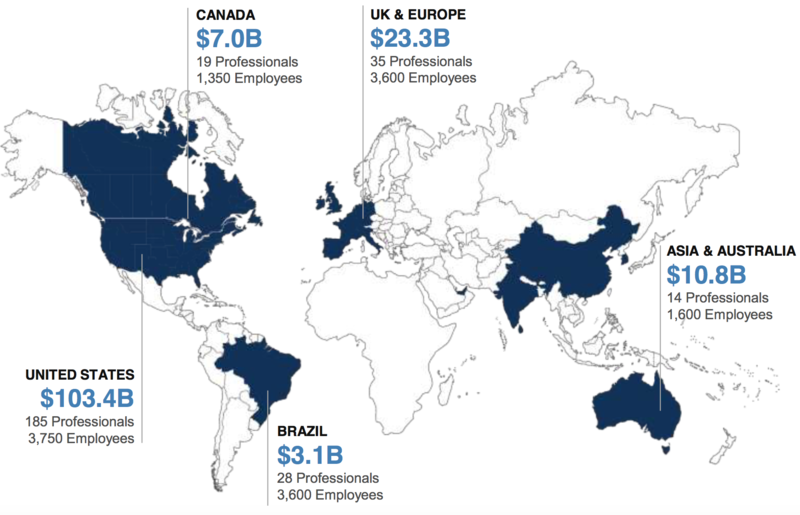 Core Office includes 142 premier office properties with 99 million square feet (msf) in major cities, including: New York, London, Toronto, Los Angeles, Houston, Sydney, Washington, DC and Berlin. The portfolio is 92% leased with an average lease term of over 8 years. A 15% mark-to-market opportunity exists on expiring leases, and the properties are generally financed with non-recourse asset level debt. Core Retail includes 127 premium malls and retail properties totaling over 125 msf throughout the United States. They enjoy a 96.5% same property occupancy and average rent spreads of 20% on new leases. High productive stores average $581 tenant sales per square foot and are owned through a 34% interest in publicly traded General Growth Properties (GGP). The opportunistic segment acquires real estate with an opportunity for improvement in multifamily, industrial, hospitality, triple net lease, self-storage and the student housing sectors. The approach is to find sectors or markets that are out of favor and where capital is scarce. Improvements are identified in distressed assets that face headwinds or are in fragmented industries. This strategy is limited to 25% of the balance sheet and BPY avoids auctions to help facilitate the 20% targeted returns. Lower volatility than other sectors. Attractive current income compared to other asset classes. Diversification, out of sync, with stocks and bonds. Income and capital appreciation characteristics of both fixed income and equity. An inflation hedge as values and rent tend to rise with inflation. Diversification by both sector and geography (North America, Europe, Australia, Brazil and others). Assets with inelastic demand located in prime markets with high barriers where space is scarce, development is difficult and, costly. Staggered leases and high occupancy providing stable cash flows. Active management increasing value through; property management, development, acquisition and financing. Brookfield was one of a few companies with access to capital during the financial crises. They are a long term contrarian investor with a strong balance sheet geared to weathering storms. They buy opportunistically while others retreat and avoid sales during panics. This discipline compounds returns over the long term. When markets are falling, I sleep well at night with my money at work buying bargains in BPY’s capable hands. How has the company performed? If you owned BPY since the spinoff, you were rewarded. 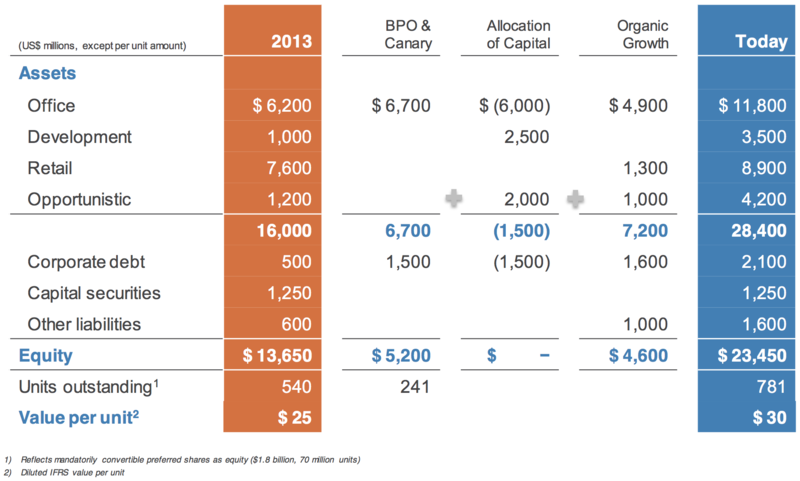 Morningstar reports BPY has a 10.9% average annual total return over the past three years. Although below their return target it compares reasonably well with the Retail REIT total return of 6.8% and, the Office REIT total return of 11.9% for the same period. Brookfield Property Partners was launched to achieve the target 12% to 15% total return over the long term. They had some catching up to do first. Initially too much capital was invested in public securities. Without control they were in the role of a passive investor. Management needed a better balance of core and opportunistic capital and increased financial flexibility. In 2014, a focus was to change the composition of the core office and retail platforms as seen in the first column of the table below. Brookfield Property Partners acquired all of Brookfield Office Properties and converted passive interest in Canary Wharf to a controlling interest. In 2015, a focus was to raise capital from mature core office holdings and redeploy it into higher return developments. Capital was committed to a number of real estate funds with institutional partners. In 2016, the focus shifted to liquidity and obtaining a S&P investment grade credit rating of BBB. The company secured a $2.5 billion credit facility with 16 global institutions and recycled capital out of mature assets in the U.S. where demand was high. Today, the development pipeline is $3.5 billion, and the opportunistic strategy is $4.2 billion. Equity increased from $14 billion to $24 billion with $5 billion of equity issued to fund growth in the core portfolios. Through 2016 BPY generated $2.6 billion in funds from operation (FFO) and $8 billion in net income. The table shows that at the current price of $22/share, Brookfield Property Partners is selling at 26% below its $30/share equity value. That’s a large discount for an investment grade company paying 5.4% and making significant progress. Traders follow stock prices while investor follow value knowing that the price will eventually catch up to the value. In the next post we’ll look at BPY’s prospects and update the company’s value. BPY is still a bargain. It is not too late to join institutional investors and diversify with alternative assets, improve returns and manage risk.